So I’m sure we’ve all seen these commercials. 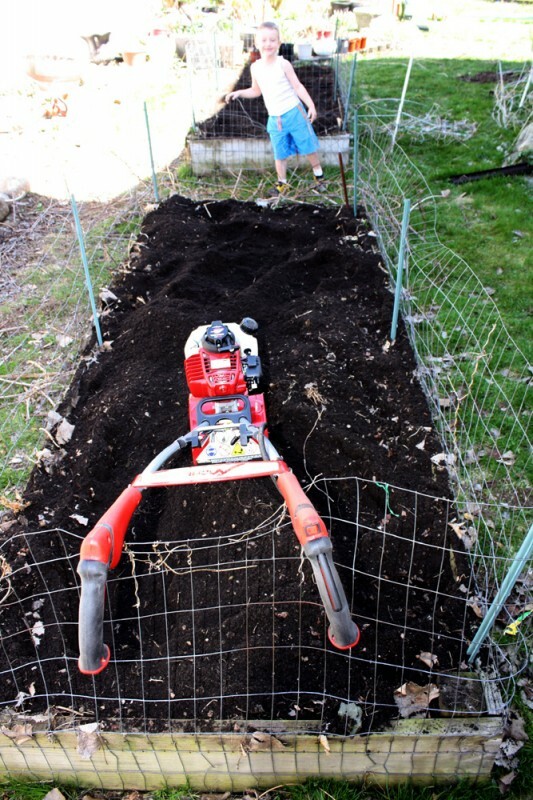 The Mantis tiller, plowing through soil, I never bought into it. My only memory of using a tiller was when young, at my parents, a big tiller, twice as big as the mantis easy, and it’d have trouble breaking through the soil. Plus in the commercials it always looked like potting mix, it seemed so staged. So sure, I thought, of course the tiller would plow through light potting mix, I bet it wouldn’t do anything on actual garden soil. Then the nice people at Mantis offered me a free tiller (best part about being a garden blogger: the free swag. Second best part? Potential tax writeoffs). Of course I accepted, because free, but I really didn’t think I’d get much use out of it, because I was skeptical. I did ask for a 4 cycle one because I don’t like having to mix 2-cycle gas. Most often they are sold as 2 cycle ones. My garden raised bed as it is found in Spring, old plants, a few weeds, leaves, etc. We finally had some nice weather and I decided to give it a try today. Assembly took about 30 minutes and was straight forward, but you need your own tools, it doesn’t come with the wrenches you would need. It took me awhile to get it started and I got a little frustrated, the pull cord on the engine is a bit short, and rather than giving in long pulls, you need to hit it with a few short rapid pulls to get it going. But once it was going, wow, it completely powered through my raised beds. Admittedly these are raised beds, so they are not compacted by foot traffic, however they are many years old the dirt wasn’t fresh by any means. Hand turning with a pitch fork, my prior MO, would take 30-40 minutes at least to do a good job, and it wasn’t nearly as complete a job as the Mantis just did, and the Mantis did it in about 5 minutes. No joke. This thing is strong enough for heavy garden soil. It might not tear up sod, but garden soil it does just fine. Just be careful near fences, at one point it caught my little fence (stupid groundhogs) and that wasn’t a good thing, it got all tangled up. My garden bed after less than 5 minutes of action with my new Mantis tiller. Tilling is a little controversial in gardening circles. It can destroy the tilth of the soil, it can bring old weed seeds to the surface where they can annoy you to death, some claim it can make a hard layer underneath (this I care less about, plant roots tend to stick to the top 12 inches of soil). In general this is all true, and certainly it makes sense to let the soil lie in many beds, but I just don’t feel that is true for vegetable gardens. Vegetables need loose soil to grow their best, obviously any root vegetable does best in light and airy soils, a compacted hard soil will give you smaller and deformed potatoes, beets, and carrots. But even other plants benefit from having looser soil to push their roots through, the plants will grow bigger, faster, and getting big fast is the quintessential goal of a vegetable garden. Tilling also has one good benefit, mixing amendments in the soil. For instance I had all this old waste from the prior growing season, random fallen leaves, and things like that, I also tossed on a few buckets of compost. The tiller blended it all in nice and clean. All in a few minutes work. It almost seems wasteful, this machine for this small amount of space, but soon, very soon, I will have my epic Martha Stewart sized vegetable garden, then I will get more use out of it. The bottom line is the Mantis went all over my raised beds, as deep as a foot down, with ease, blending the soil in minutes. It was great, I can definitely recommend it. Great to hear your opinion Chris! Like you said it definitely beats the stone age method of the old pitchfork in the ground. Seems like just the product I’ll need for my veggies this year – I would say my garden looks a little closer to your “before” picture at the moment. Thanks for sharing! Your garden making work is so nice.I’m really loving the theme/design of your site.Nice blog here! Additionally your web site so much up very fast! Hello, I love my tiller as well, just upgraded to the Mantis! It literally powers through with ease. 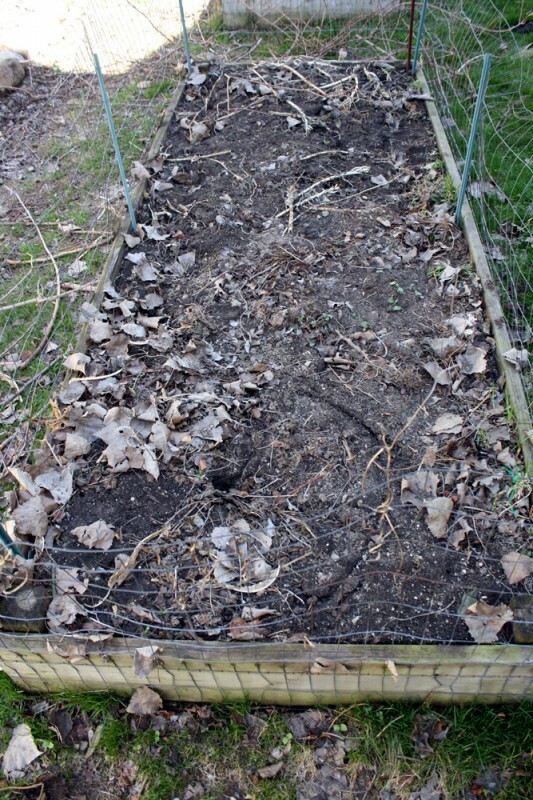 One of my favorite ways to create new beds is to till them heavy in the fall with a mechanical tiller, cover with wet cardboard or newspaper, then a thick layer of shredded leaves, and then layer over some black plastic. Remove the plastic in the spring, and the bed is a perfect, ready to use perennial and shrub border ready to plant. So good to see your little one with you in the garden. Enjoy your free swag! Have you considered trying to use Perlite to make your soil more aerated instead of tilling? That is another option to add aeration to your garden. I’m glad you enjoyed your experience with the mantis tillers. I’ve had one for awhile now, and was somewhat skeptical that it would work was well as the commercials I saw showed. I’m glad it did, though, because I use it all the time! Looks great. Enjoy our gardening this spring and summer.